To be implemented on Sunday 9 December 2018 at approximately 6am. Longstanton and the eastbound on slip road. It will then divert motorists in front of the old Lolworth services from where they filter onto the A14. This will allow Highways England to remove the current temporary westbound slip road and to begin construction work in this area. The eastbound entry slip will be unaffected as will the westbound and eastbound exit slip roads. If motorists are travelling from Longstanton direction and wish to travel westbound. They will have to negotiate the island at Bar Hill and travel back towards the slip road. There is no right turn onto the new westbound slip road. To help address traffic issues of night time peak flows out of Bar Hill, a single traffic signal just north of the traffic island on the B1050 travelling from Longstanton is proposed. This will be manually controlled and monitored to measure effectiveness, and adjusted as appropriate. 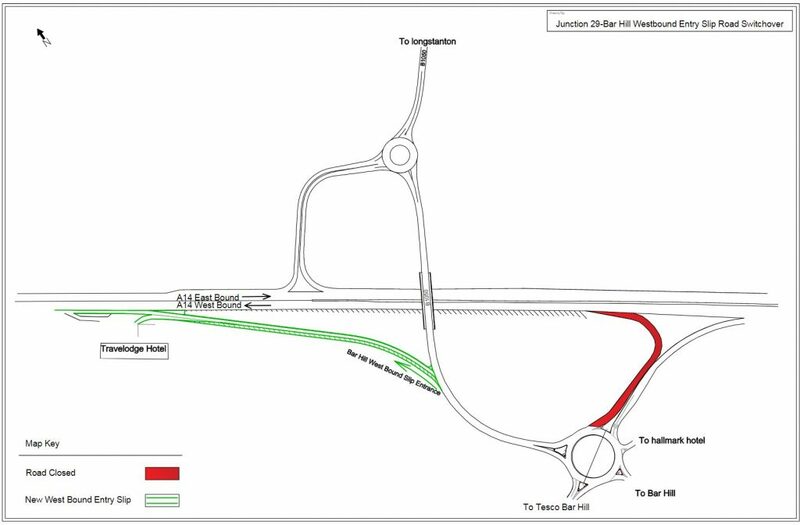 This will allow traffic travelling from the Longstanton direction to be held for short periods allowing traffic travelling out of Bar Hill to have easier flow onto the island during that time.